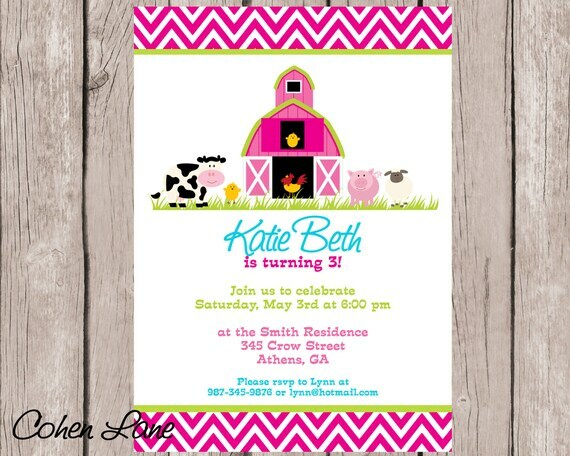 Pink farm party invitation that is perfect for any barnyard, petting zoo or farm birthday party. All invites are customized by me and are printable so that you are able to save money and time by printing locally or emailing, texting or posting on social media. This listing is for a digital file only. No physical item will be sent. 1. Email your invite information to cohenlane@hotmail.com once payment is completed. 2. Next you will receive an email within 24-48 hours via the email address that is listed on Etsy. 3. You then approve or send corrections back through email. 4. Once approved you will be sent a final copy that is all yours to print. If corrections needed to be made I will send you another copy to proof so that we can get it just perfect. 5. Lastly you save and/or upload your invitation to any place of your choice for printing or print on your own computer. 2. State the card size that you plan to print, either 5x7 or 4x6. 3. Email address that you want your proof and final copy sent to. ♥ NO REFUNDS ONCE YOUR INVITE HAS BEEN EMAILED FOR PROOFING. Printable Two Peas In A Pod Invitation. Twins Baby Shower Invite. Twins Invitation. Boy and Girl Twins invite. Skating Invitation. Skate Party Invite. Skating Birthday Invitation. Skate Invitation. Roller Skate Invite. Peace Love Skate. Digital.